We’re not filling the seats like we used to! All good things must come to an end, including the recording careers of once-mighty rock bands. But while some classic artists ended their careers on a high note, including The Police – Synchronicity, Jimi Hendrix – Electric Ladyland and The Beatles – Abbey Road (on a technicality), others surrendered without a fight with a disappointing (commercially and/or critically) album that is rarely mentioned in the same sentence along with the rest of their catalog. In this blog, as far as final release go, I’ve excluded albums of artists who died shortly after releasing what would turn out to be their final work (The Doors – L.A. Woman, John Lennon – Double Fantasy, Nirvana – In Utero). That’s because rock loves the dead guy, which means that hipster blogs attempt to revise history and have desperately tried to paint these albums as the crowning achievement in these artists’ catalog. (File under “Fake News”). Finally, some acts fall into “haven’t been relevant for years” category when the final album drops. This group includes R.E.M., Queen and Grand Funk Railroad, so I’ve disallowed albums by artists like them. And obviously, any posthumous albums (Pink Floyd – The Endless River, John Lennon – Milk and Honey and any post-9/18/1970 Jimi Hendrix releases, no matter how brilliant) have been similarly barred from consideration here. In rock history, no punk band stayed to their principles from inception to arena status, except for The Clash. Up until 1982, that is. After releasing four albums that (cliché alert – yuck!) pushed the envelope of what was acceptable in the framework of punk rock, the band managed the impossible balancing act (a feat up there with pulling off “friends with benefits”) with the release of Combat Rock: Being a commercially successful punk rock band that stayed true to its original ideals. Somebody is hiding something: The official website of The Clash ends in 1983, not 1985. Needless to say, these two scabs didn’t share the same “history” as the others (not to mention the same vision) – so, in the big picture they were no different than Jimmy Crespo, Vinnie Vincent or Paul Chapman – replacement guitarists that were hitching a ride on a band with a platinum past. 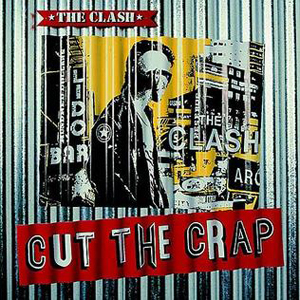 And to think that 1985’s double LP Cut The Crap meant anything to anybody, well, let’s just say the album wasn’t even mentioned on The Clash’s The Clash On Broadway box set or on its website. Trivia: 1990s one trick pony band Jackyl also release an album titled Cut The Crap. 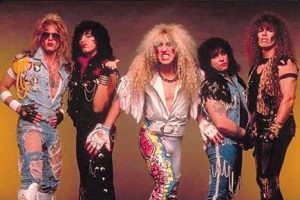 No band pushed itself harder for success than Long Island’s Twisted Sister. Working every New York/New Jersey/Connecticut club and dump five nights a week, the band punched the clock for more than 2000 gigs before even signing a record deal. (Reference point: Led Zeppelin performed less than 700 times in its twelve-year career!) It took seven long years of steady gigging from vocalist Dee Snider’s debut in 1976 until the band’s first stateside release, 1983’s You Can’t Stop Rock ‘n’ Roll. Crashing through the door opened by gateway pop/metal band Quiet Riot, Twisted Sister hit the big time the next year; Stay Hungry, the band’s biggest (and best) album, which contained the anthem “We’re Not Gonna Take It” went platinum, and the band spent the next year touring the world. The “Sister” at the pinnacle in 1984. Three short years later, it was all over. Eager to strike while the band was hot, Twisted Sister attempted to unite the entire music audience under one album, Come Out and Play. The pop songs would be poppier, the metal songs would harder and the anthems would be even more timeless. Everybody within earshot would walk away happy. What could possibly go wrong with that plan? Everything, it turned out. Featuring the ill-advised lead single, a cover of The Shangri-La’s “Leader of the Pack” (in the band’s defense, they had performed it – to positive response – in their club days), the album, which was supposed to appeal to everybody, ended up pleasing nobody. Especially the band’s core metal audience. 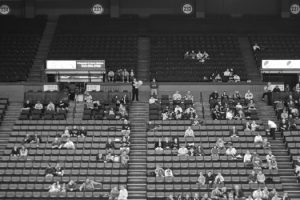 The ensuing tour was plagued by empty seats and overall apathy and was quickly scrapped, with the standard PR response mentioning throat problems for Snider’s. After hiding out for a year, the band (minus drummer AJ Pero, who quit in disgust in the meantime), released less-than-metal Love is For Suckers, helmed by the hot producer de jour, Beau Hill (Ratt, Fiona). While Suckers pales in comparison to Hungry (and Play, for that matter), its overall desperate-for-a-hit tone sounded like a band whose sell-by date had past. (I never bought into that “it was supposed to be a solo album, but the label pressured us into releasing under the group banner” party line.) Twisted Sister broke up two months after the album’s release. Trivia: The band reunited 14 years later and toured the world until officially retiring in 2016. Dire Straits hit it big from the word go – its 1978 eponymous debut album and single “Sultans of Swing” were able to somehow fit in an era filled with punk, stadium rock and disco, all while sounding nothing like any of those genres. But its sophomore album suffered from the “Pretenders II conundrum” – not as commercially successful as the debut, and fans were divided whether it was a masterpiece or dog. Same with its third album; by then, Dire Straits had become a cult act, no hit singles and suffering from declining sales. Love Over Gold, the fourth album was a fan favorite, but its commercial potential was somewhat limited by the fact it only contained five very long songs. (The shortest song, “Industrial Disease” was 5:55; the longest track “Telegraph Road” clocked in at over fourteen minutes.) The band, at a crossroads, released a live album and plotted its next move. Headband: OK in 1985, not so cool in 1991. The ensuing LP, Brothers In Arms was an enormous hit in every area; sales, critical acclaim, airplay (both radio and especially MTV, due to its unique video), but most vitally, the band hit a cultural nerve, something that few acts have the potential to achieve. (Even the cover art became iconic.) 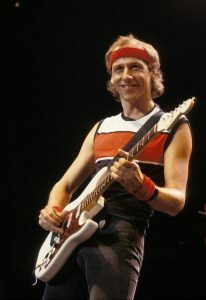 And for a few seconds, between Dire Straits and Bruce Springsteen, headbands on guitarists was a cool look. The band, of course, embarked on a wildly successful tour that circled the globe the next few years. By the time they came back with new product, it was late 1991. Not the best time for bands from the 1980s to release an album due to the rise of grunge and alternative bands. (Or maybe it was the headbands that doomed them.) On Every Street sold respectably (one million in America compared to Brothers’ nine million), and charted considerably lower (#12 peak, compared to Brothers’ nine weeks at #1). Of course, there was enough carryover demand from the Brothers era for a successful world tour. 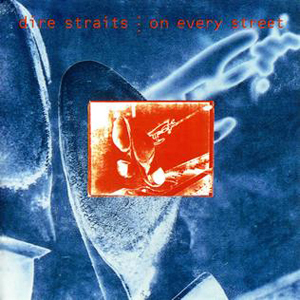 Trivia: Like John and Tom Fogerty in CCR, Dire Straits featured brothers (Mark and David Knopfler) in its initial lineup; also like CCR, the one who didn’t sing, write songs or play lead guitar exited the band for a non-existent solo career.